The elliptical machine is actually a pretty good exercise machine that’s practically made for facilitating weight loss. And, it doesn’t even use features that empty promises from many so-called fitness experts tout as ‘fat burning features’ either. There Are Many Brands Of Elliptical Machines To Choose Between, This Particular One Is The New Sole E35. That particular description is reinforced by the fact that the elliptical often works the upper body using ski-pole like handles or bars, while the lower body gets thoroughly worked with the machine’s bottommost pedals. This ultimately produces a workout that actively stimulates the upper body and the lower body at the same time. So, the sheer versatility of elliptical machines as a cardio workout machine makes them well suited as an exercise machine that’s best suited for weight loss. I see… so, what is it that makes elliptical machines best suited for weight loss? Does it involve the cardio-friendly actions of the machine itself? The movements of the elliptical machine are what helps facilitate the fat burning effect that are often the result of cardio workouts. What the elliptical machine does is help move your legs, your knees and their accompanying joints in an elliptical motion; that same motion, while not completely free of impact, has a lot less impact than you would experience when running. With elliptical machines, you can actually adjust the resistance and/or intensity that affects the machine; if you need to, you can also change the stride incline and length of the machine. So, if you want to do a completely different workout, the option is there. The best thing about these options is the fact that you can completely alter the machine’s ‘workout threshold’ to suit any workout that you want. If you wanted to do a high-intensity fat burning workout, to provide an example, you could definitely use an elliptical machine to accomplish that. All right! How do elliptical machines work the muscles of the body? Can you tell me what muscles elliptical machines usually target in workouts? 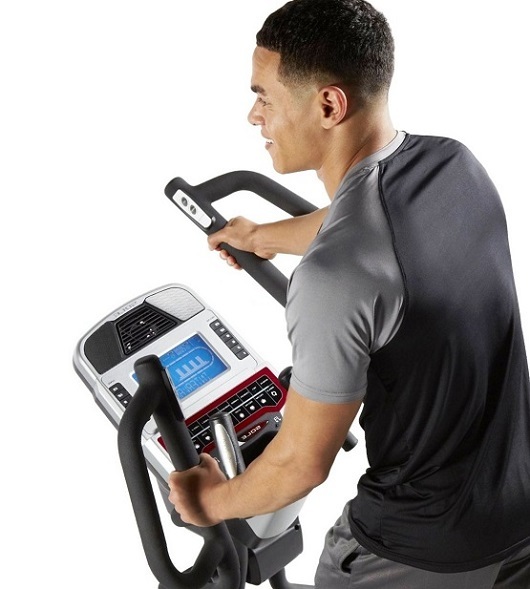 Elliptical machines are actually known to work several groups of muscles within the lower body and the upper body. In fact, it’s so effective as a lower and upper body trainer that it’s considered a ‘cross trainer,’ since it trains both sets of muscle groups at the same time. One of the muscles that elliptical machines target within the lower body is the gluteus maximus or, rather, the muscles of the buttocks. To further workout your glutes and make your buttocks firmer, it’s suggested to increase the incline—increasing the incline will help work your thigh muscles and your buttocks muscles at the same time. And, speaking of thigh muscles, the hamstrings are one of those many muscle groups in the thighs that get worked during an inclined elliptical machine workout. You can also have the machine in reverse to further boost its capabilities. The calves (gastrocnemius) and the lower shin muscles (tibialis anterior) also get worked thoroughly during an elliptical workout. Probably the best thing you can do to promote that workout is holding onto the machine’s handlebar and pushing your energy into your legs, alternating your movements in a forward and backward motion. Like you’re biking up a steep heel, push your heels into the pedals as you go backward. As for the upper body, elliptical machines often work the chest muscles (pectoralis major), upper arms muscles (triceps), the muscles at the front of the arms (biceps) and the deep core muscles of the body. Though, an interesting thing to note about elliptical machines and the upper body is that they only really target a smaller group of upper body muscles than most would assume. So, even if you use elliptical machines to get a full body workout, you’d still need to supplement your upper body workout with some weight and/or resistance training. Despite that, elliptical machines are still great total workout machines for people that don’t undergo intense workout routines on a regular basis. Well, now that I know more about that, what are the main advantages to using elliptical machines for weight loss? Anything I need to know before I start shopping for elliptical machines? It’s pretty easy to explain the main advantages of using elliptical machines. To start, the low impact and highly resistive workout makes it a great cardio workout machine, especially if you like to undergo high intensity workouts during the week. The low impact nature of the machine, too, also influences its advantages. Since it’s low impact, it lets you burn more calories while seemingly working less when on the machine. In actuality, you’re working as hard as you would if you were made to exert more energy by the machine. It’s all because of its shock absorbing nature that ‘absorbs’ the force that you put into the machine that may affect your body and the machine itself. So, thanks to that, you can run and walk on an elliptical machine and not feel the detrimental effect of muscle and joint strain after running. You can even adjust the machine to suit the type of workout you’re willing to perform. While some people target all of the available muscle groups of the upper and lower body, others focus on one muscle group at a time. Probably one of the better advantages of elliptical machines is the fact that literally anyone can use an elliptical machine. As a low impact exercise machine, it’s gentle enough for older people, people with injuries and/or people with illnesses to use on a regular basis, since the machine can be adjusted to their workout needs. That should be a good enough reason for anyone to consider shopping for elliptical machines. Learn about my latest recommendations and reviews of elliptical machines >>.